Have you ever watched your 10 lb. kitty try to squeeze int a match box? What is it about boxes, coffee cups, sinks, bags, shoes, tiny spaces, even items that appear too small to contain them, that cats find alluring. 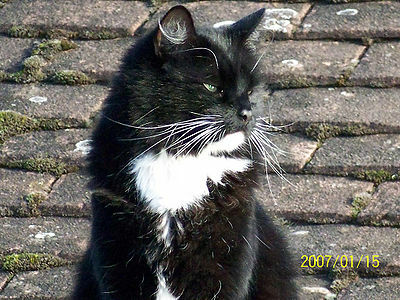 Claudia Vinke, ethologist (ethology-study of animal behavior) at the University of Utrecht, the Netherlands, led a research team to study stress in shelter cats . Ten of nineteen new cat arrivals at a Dutch animal shelter had access to boxes while the other nine did not. 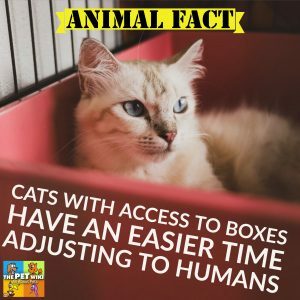 Results showed that the cats who could hide in the boxes adjusted more quickly to shelter life, were less stressed and interacted better with humans. According to Ms. Vinke since all cats respond to stress by hiding, the results made sense. 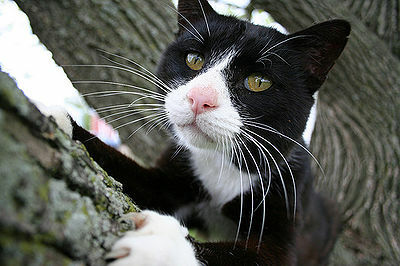 Wild cats when threatened, seek safety in trees, dens or caves. Boxes and other items cats choose may serve the same purpose for our pets and cats that wind up in shelters. There is another reason that cats enjoy confined spaces. They like an environment that has temperatures of 86-97 degrees Fahrenheit. We humans are more comfortable at temperatures of 66-77 degrees Fahrenheit. Small spaces and boxes provide the warmth for cats that may be lacking in the rest of their environment. At the Maddie’s Shelter Medicine Program, Cornell University College of Veterinary Medicine which provides care for homeless animals, veterinary student and shelter staff are trained to handle the challenges of keeping the animals physically and emotionally happy. Since the study showed that this makes cats happier, try to provide your cat at home with boxes so that s/he can curl up and be content. You may also want to donate boxes to your local shelter. 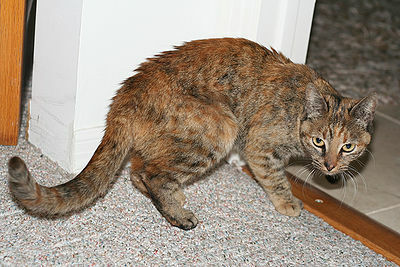 For more information on how you can help shelter cats, check the Animal Rescue site. Vinke, C. M., Godijn, L. M., & Van der Leij, W. J. R. (2014). Will a hiding box provide stress reduction for shelter cats?. Applied Animal Behaviour Science, 160, 86-93.